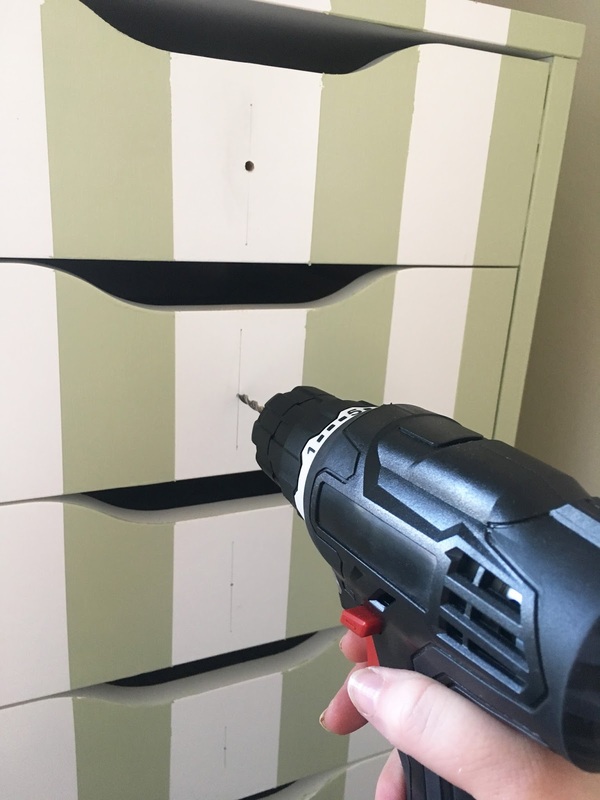 It is so easy to customise your Ikea Alex drawers and didn't take me that long to get the finished result that I wanted; the only thing that takes a long time is waiting for the paint to dry and measuring where everything goes. I absolutely love the finished result and I think it just makes them look so much more interesting. So if you have an Alex drawer and are thinking of customising them then here is each step of how I customised my Alex. Firstly, I had to think of the design that I wanted to use on my Alex. Like I had already said I was inspired by Fleur De Force's Custom Makeup Storage Video. 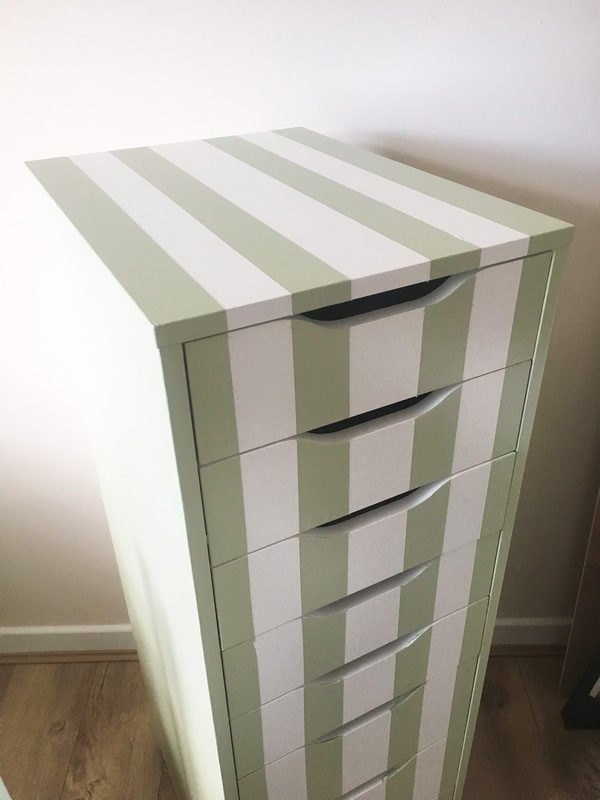 I loved the result that she got with her Ikea Alex drawers and I thought the striped pattern would be perfect in my beauty room/spare room. 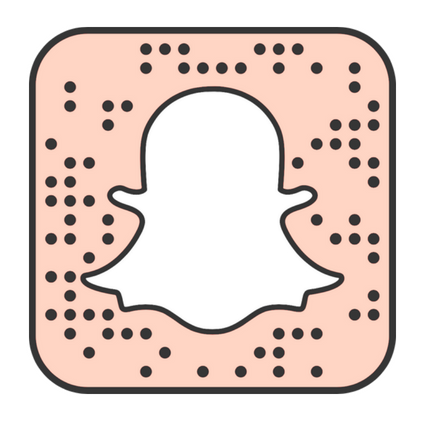 However, there are so many tutorials available and you can be as creative as you want when customising your Alex. I next chose a paint colour; like I had already said my room that the Alex was going into is blue and green, so I wanted to have be represented in my Alex. I used Farrow & Ball 'Cooking Apple Green' in the Estate Eggshell Finish. You do not have to use the same brand of paint as me but just make sure that whatever paint you do use is suitable for wood or is in an eggshell finish, as I found that this gave the best results. Next I had to use masking tape (I used the Frog Tape, as it does not allow the paint to bleed and you get a sharp line) to mark out the stripes. I used the thinnest masking tape from Frog Tape to determine the thickness of the stripes. I found that two strips of the tape was the perfect size for the stripes I wanted and then the middle stripe was three strips. 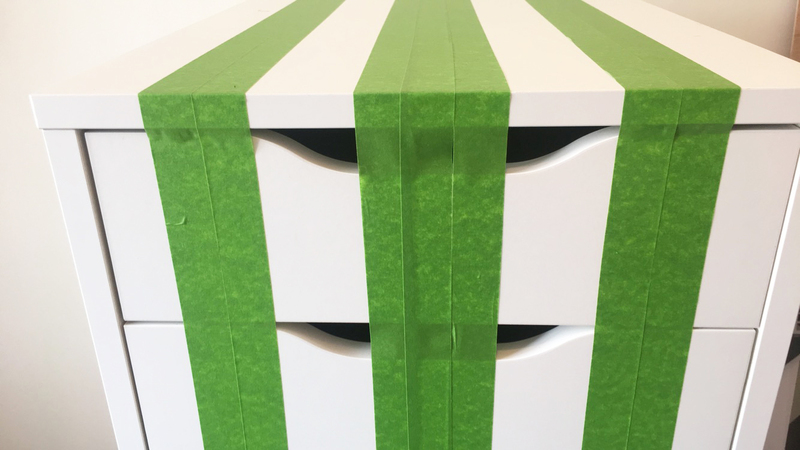 Therefore, if you want smaller or bigger stripes then I would recommend using a different width of tape or using more or less strips. 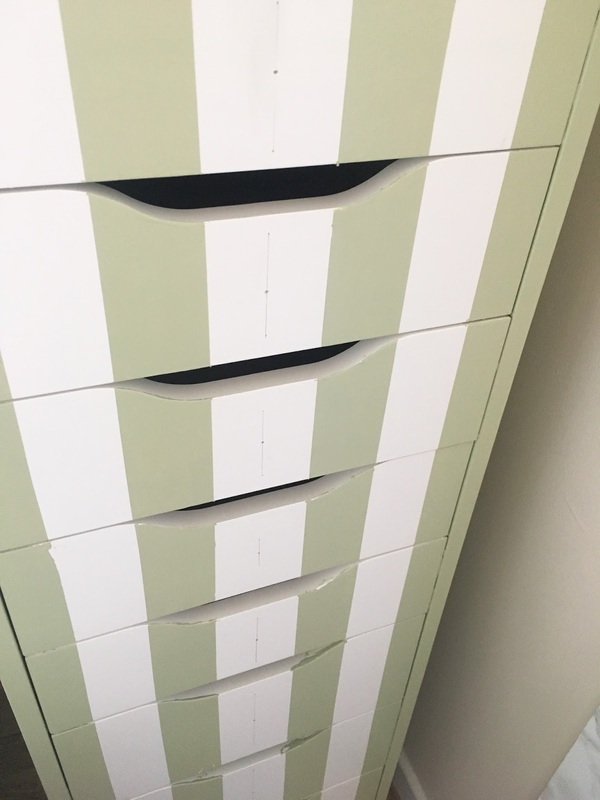 I applied a a little strip of tape to every drawer to act as a spacer in between the non-painted stripes so I was sure that each stripe was evenly spaced. I decided that one strip of tape was too thin so I placed two strips together to create a wider stripe (but you could use a wider tape to get the width you want. I also found it was best to work from both sides in (as an even number of stripes does not fit in the width of the unit). Therefore, there is a bigger stripe in the middle where the door knobs will go. Once I have the stripes marked off, I removed the spacer strips so I could paint the stripes. I painted the sides of the Alex drawers with three coats of the paint, making sure to wait for each coat to dry before starting the next! Next I painted the stripes on the top and the drawers that were masked off. Once again I had to paint three coats to get an even coat. You could use a primer but that just adds more expense to the project so it is not really needed. Plus it only took an hour for each coat to dry. Then you want to leave the Alex to dry completely overnight, before removing the masking tape. 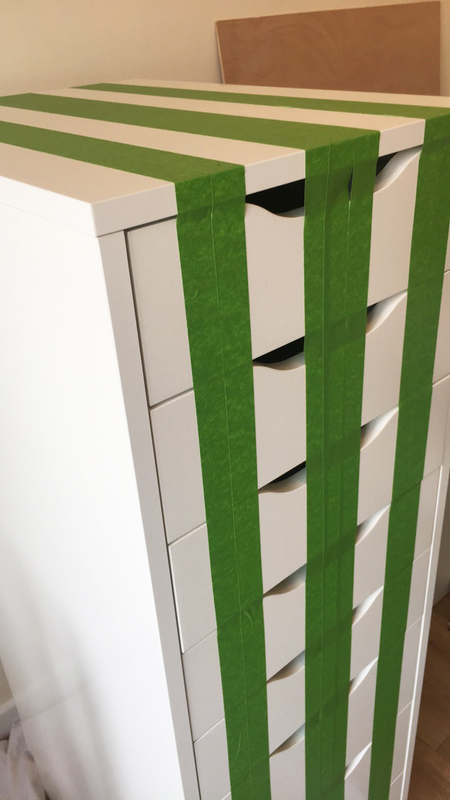 There might be some bleeding of the paint when you remove the tape (just because there might be some parts where the tape has not stuck flat to the drawers). However, all you need to do is get an old loyalty card or old gift card and scrape off the paint where it has bled. Then you should have perfectly straight stripes! Finally, with a ruler and pencil I measured the centre of each drawer (this is where the knobs will go). Where I had measured the centre of the drawer, I drilled and then popped in butterfly door knobs that I had purchased from Amazon. I paid £10 for 10 and I really love the antique gold look to them and I think they go perfectly with the theme of my room. I also love the door knobs from Zara Home but they are quite expensive, so I thought these would be the best option for now and then I can buy some from Zara in the future. But I think the butterfly door knobs from Amazon look amazing and there are so many different types that you can get on Amazon or from any other shop that sells door knobs. 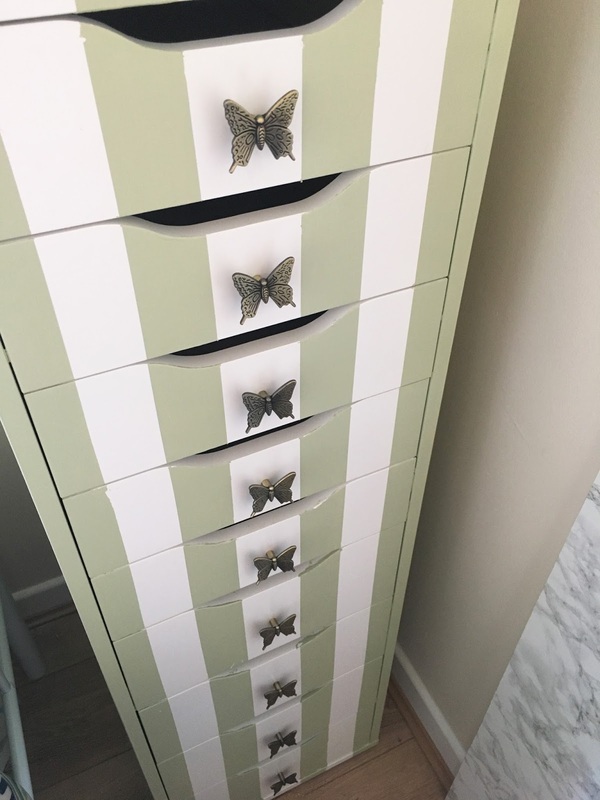 I would love to know what you all think of my Alex drawers, and let me know in the comments whether you are thinking of customising your Alex drawers, after seeing this post? 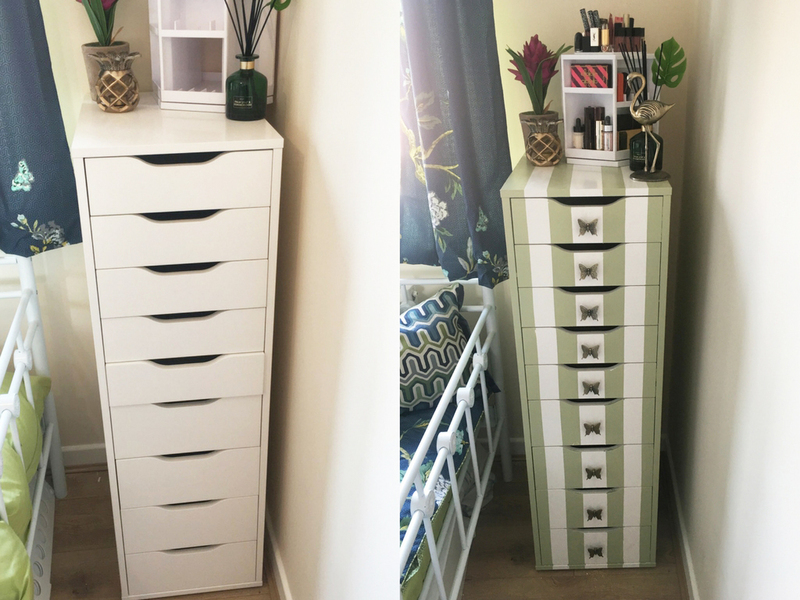 I absolutely love the finished result of my customised Ikea Alex Drawers, and I will definitely be customising more Ikea furniture in the future.